In the late 60's low profile tyres were developed, and the tyre size 185/70VR15 was developed and in 1969 PIRELLI released the 185/70VR15 CN36 CINTURATO ™ HS tyre. 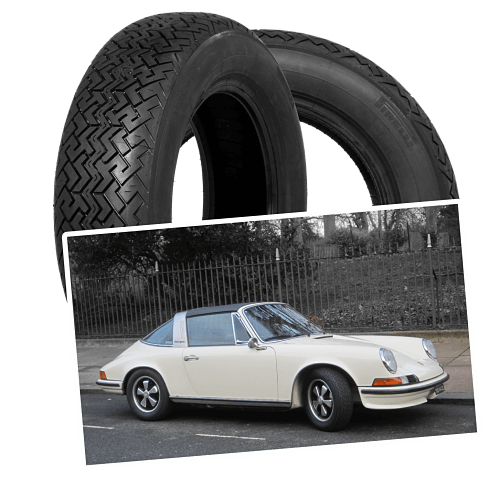 The tyres size 165HR15 was a pretty common tyre size, used by sports cars of the 60's. When low profile tyre technology was develop some car manufacturers (such as Porsche; with their 911), moved onto low profile tyre technology fitting 185/70VR15. The side wall height of a 185/70VR15 is 70% of 185mm tall. the side wall height of a 165R15 is 80% of 165mm tall. These 2 side wall heights being the same made the 185/70VR15 the ideal low profile alternative. Porsche jumped on the opportunity to take advantage of, one of the worlds best tyre manufacturers, new developments with low profile tyres, and fitted PIRELLI's 185/70VR15 CN36 CINTURATO ™ tyres to their 911, 924 & 944 cars. Many people with cars that fit a 165R15 often want to fit a wider tyre, under those circumstances the 185/70VR15 CINTURATO ™ CN36 tyre would be an idea. It is worth considering if you have a car like a TR4, TR5, TR6 or MGC the manufacturers of these cars chose to fit 165R15 tyres long after the 185/70R15 tyre size had been invented. They stuck with 165R15, because that is how these cars handled best, under these circumstances possibly the 165HR15 PIRELLI CINTURATO ™ CA67 tyre would be a better option.